Sparkling natural emeralds in a beautiful necklace set. 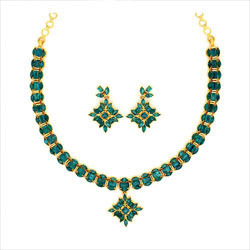 This exquisitely crafted necklace set with precious emerald stones would compel you to wear it at all social gatherings. Established in the year 1996, at Delhi (India), we, “Prakash Gems”, are one of the well-established manufacturer, exporter and supplier of an exclusive collection of Certified Gemstones, Diamonds and Diamond Jewelries. The offered products include Diamond Necklace Sets, Diamond Rings, Diamond Pendants, Diamond Pendant Sets, Loose Diamonds, Ruby Necklace Sets, Ruby Rings, Ruby Pendants, Sapphire Jewelry Sets, Sapphire Pendants, Sapphire Earrings, etc. These are crafted using the finest quality raw gems, precious stones and sophisticated technology in conformity with the well-defined industry norms. The products offered by us are in huge demand due to their eye-catching appearance, classy design, traditional touch, excellent finish and superlative quality. Keeping in mind the variegated and specific needs of the clients, we also bring forth our products in various customized options. In addition to this, our valuable clients can avail the offered products from us at very competitive prices.